All my boys have made it to their new homes. It was so good to see each family and the joy of getting to take their puppies home. Galadriel is with us until Saturday so we couldn't help but take one last set of pictures. She is such a cutie and is so loving. This will be my last post to this litter. I hope you have enjoyed all the pictures and comments. Each puppy is dear to us and we truly strive to give an accurate portrayal of all the details that we observe. We look forward to sharing with you our next litter. This is my last week with these puppies (always sad for our family but exciting for the puppies and their new families). They are so cute and loving. In fact, most of the pictures are of the puppies being held because if they are on the ground, they are on my lap (or my daughter who managed to get the few good outside pictures).The puppies get their veterinary examination this weekend. We are crate training now to help the process of potty training. The puppies have already managed to make it 8 hours! I completed the new weights for the puppies today (Friday). All of these puppies are very good sized. Normally, their week seven weights will be between 8-13 pounds. The smallest weight I have ever had is 6 pounds 4 ounces so Legolas (the smallest this litter) is actually a normal weight with very good sized brothers and sister. Theoden's is the heaviest week seven weight that I have had (by a few ounces). All the puppies are healthy, active, and loving. The new homes are going to be getting bundles of love early next week. How exciting for the puppies and families! Aragorn is a very playful and loves being outside when our weather is good. He likes being with people and being held. He has a thick and beautiful coat. Legolas is playful and loves to explore. He also loves being with people. He is smaller but very solidly built with an incredibly cute face and smile. Theoden has a very thick coat and loves to play with Aragorn (others too). He likes to explore and loves being held (you will notice he is hands free in the pictures). Galadriel is really sweet, smart and beautiful. She likes to play with the other puppies and to explore when outside. Adopted by April & Ed O.
Aragorn continues to be our most cuddly puppy (they all love being held--but he is the king cuddler). He is still my daughter's favorite because he can do everything (play, sit, cuddle). Adopted by Jeff & Erin G.
Gimli continued to add height and length this week, but my weighing must be before his eating this time because he is lighter. He has a wonderful coat and his coloration is very white. Gimli is very friendly and loves being held. Adopted by Colleen & Robert S.
Theoden has really grown this week and is now our largest puppy. His coat continues to look thick and full. He has really enjoyed his time outside this week. Galadriel continues to be a real sweety who loves to cuddle. She is getting a thicker coat now and is really looking gorgeous as a result. She likes to explore when outside. The puppies continue to do well and grow. Their coats are looking fantastic. You will see from the pictures that several of them have thick wavy coats. What will not show in the pictures is that there are two very slight differences in color. When dry, they all look very white. When I am washing them, Gimli, Legolas, and Galadriel all have very white coats (as white as I have had). Aragorn and Theoden have a very slight coloration while washing that may add a little color to their coat later on (they are still very white and will probably be white--I am just describing what I see as fully as possible). The thickest coats belong to Gimli and Theoden. It has only been two full days since my last comments so I will mostly cut and paste the comments from below here. The weights are from today. Hope you enjoy the new pictures. I will conduct and post the results for their personality test tomorrow. As puppies are adopted, I move them to a section below the available puppies to make it easier for those still selecting. I will continue to post comments and take pictures. However, you will find that they have been moved to a different location. Legolas was very active for my daughter and did not want to sit still for long. He was also incredibly active while getting his pictures taken (by me). My son says he is very relaxed and loves being petted and that was true right after his bath. He is very sweet and likes to be with humans. He followed and came as he should. Aragorn is an active puppy (we all concur). He is more inquisitive into his environment than his siblings. He loves to play with us and enjoys being bathed. He had a very good couple days of growth--almost a pound (it is possible that it was before eating and after eating, but he was bigger too). He is turning into a real cutie too! Gimli is very explorative when he is outside. He spent most of his time with his nose on the ground. He also likes to likes to playfight with the other puppies. He was a little more unsure when my daughter began her testing with him but did get used to it and enjoyed it. His coat is very thick and wavy and is also very white, even when wet. ﻿Adopted by Colleen & Robert S.
Theoden is becoming very beautiful. He has a nice coat and beautiful eyes. He likes to climb onto people's laps and is very affectionate. He does like to playfight with his brothers. He responded very well to the come to me and follow commands. His coat is becoming very thick and wavy and though the pictures do not show it, he has a very slight color when wet. Galadriel is really cute and likes humans. She has times where she is playful and other times where she wants to cuddle. She followed well and came well. She loved being held after her bath. Our puppies are 5 weeks old now and are looking fantastic. We are also doing some training and my daughter told me that these were the most active and easily trainable puppies that she has worked with. The puppies are continuing to grow quickly. As I put down the descriptions below, my son, daughter, and me all have slightly different experiences with them (I have Gimli as the most inquisitive and my daughter experiences him as most relaxed). The descriptions with a combination of all our observations. Aragorn is an active puppy (we all concur). He is more inquisitive into his environment than his siblings. He loves to play with us and enjoys being bathed. Gimli is very explorative when he is outside. He spent most of his time with his nose on the ground. He also likes to likes to playfight with the other puppies. He was a little more unsure when my daughter began her testing with him but did get used to it and enjoyed it. Legolas was very active for my daughter and did not want to sit still for long. He followed and came as he should. My son says he is very relaxed and loves being petted. He is very sweet and likes to be with humans. Theoden is becoming very beautiful. He has a nice coat and beautiful eyes. He likes to climb onto people's laps and is very affectionate. He does like to playfight with his brothers. He responded very well to the come to me and follow commands. Galadriel is really cute and likes humans. She has times where she is playful and other times where she wants to cuddle. She followed well and came well. The puppies are looking beautiful. They got to enjoy a little time outside today since our weather was warm. It was amazing at how quickly they fell in love with their new environment. They have continued to grow really quickly. They are mature looking already (for puppies) and are continuing to stay healthy. Aragorn is really friendly--probably the most friendly of these puppies right now. He loves to fall asleep on us and is just a loving puppy. He is playful and loves to chew on things. He is the second most playful puppy right now. Gimli is our largest and most playful puppy. He loves to be held. He has a beautiful looking coat that looks like it will be full and curly later on. Legolas is our smallest puppy but he is very active. He loves to be held a lot and is probably our cutest puppy (though small puppies tend to look cuter). 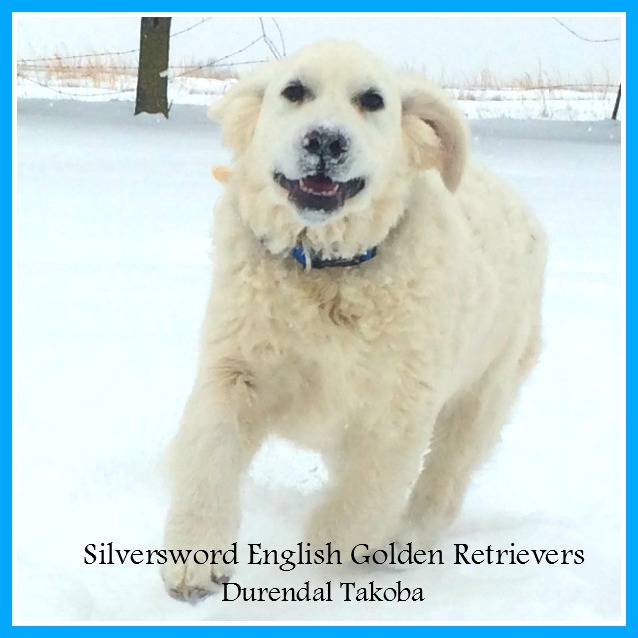 ​Theoden is our second largest puppy. He is more calm though he will play fight with Gimli. He likes to explore and be held. Galadriel loves people. She is not an active play fighter at this point. This is my second entry for week 3--this time they are 5 days into the week. They received their name tags today so they will have their individual pictures from now on. I am also going to include weights each week. The puppies continue to grow really quickly and are becoming incredibly cute. They are friendly and love to be with people but also like to play with each other. Aragorn is my second smallest boy puppy. He loves people and has a very cute face. Gimli is our largest puppy. He has a beautiful coat and face. He likes to play fight but also likes to sit on my lap. Legolas loves people and likes to playfight with Gimli. He is our smallest puppy and I think he is going to be really cute as he ages. Theoden is our explorative puppy. He is 2nd largest and likes being with people. Galadriel is really cute and friendly. She also likes to explore and likes playing with Gimli. These puppies are amazing! Their eyes are open now and they are crawling around. They make the cutest sounds when we hold them. They seem to talk to us. One night, I spent five minutes talking back and forth with a couple of them. Some of their faces have coloration--it is probably just staining from their food, since I can't wash their faces. They are eating solid food occasionally. It is neat to see one fall asleep in the bowl while eating. The puppies seem to have very thick wavy coats. I noticed this on my last litter (from Orcrist) with Colt. If this continues, these puppies are going to have beautiful, thick, coats. Hope you enjoy the pictures. The puppies continue to grow nice and plump. My son has identified who will become Gimli (big and fat!). All of the puppies are doing really well. They seem to be an active group, based on their response to neurological stimulation. That is normally a sign that they should be intelligent, playful, and full of life (which they should be!). As always, they already love to be held and cuddled. It amazes me how even a tiny puppy can appreciate loving language and time being petted. Day 4: The puppies are doing really well. They are very active when awake but sleep most of the time. That is a sign that they are very content--with their bellies full. I have done 2 days of neurological stimulation now and they are right on course for their responses. Daisy is a happy mother. We have named our girl Galadriel and our boys will be named, Aragorn, Legolas, Theoden, and Gimli. The boys will be given their individual names at week 3 or 4. Day 2: The puppies have continued to do very well. However, we had a tragedy when we brought our other dogs in for the night. Daisy was afraid and protective and she stepped on her puppies. Three puppies did not make it. We begin neurological stimulation tomorrow. That will be amazing! Day 1: Daisy delivered 8 strong and healthy puppies last night and this morning (December 29th). Daisy is doing great and her puppies are very active. The first puppy born was crawling all around until she had another puppy for it to snuggle with. It looks like some of the puppies are going to have the curly, rich hair that both grandpas have and that both Kobe and Daisy have (though not as evident in their pictures). Daisy has lots of milk and it is wonderful--I get to sleep because the puppies are content and full. My first check on the puppies showed 6 boys and 1 girl. I will recheck in 2 days to verify.